I visited Elbow Room for the first time last week. I understand that they had recently moved to this new location on Walnut Street, but since I had never been to the old one before, I can't really make a comparison, although I did think the new location was pretty spacious and nice. I was with a large group, and Elbow Room was very accommodating about that. While waiting for everyone to show up, I perused their extensive beverage selection and ordered an Excelsior Sirah. 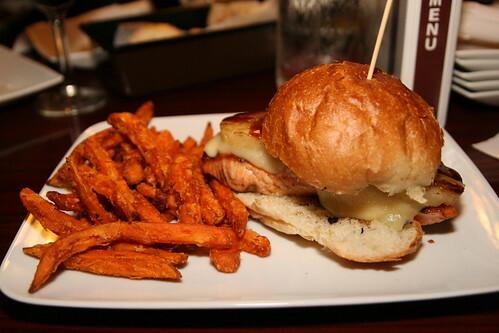 As for menu options, the Don Ho Burger, which comes with a teriyaki barbecue sauce, pineapples, and Swiss cheese sounded really interesting, but I am a bit picky about the source of my ground beef, so even though I was craving a beef burger, I went with the salmon option instead. And I did not regret it. 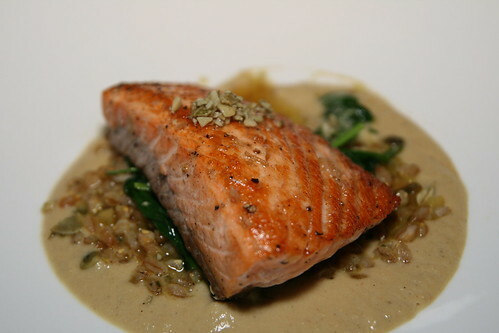 The salmon was delicious. The burger was simple, as in not terribly complex in flavor, but the combination of ingredients just worked well together. I also paid the extra $1.50 to upgrade to the sweet potato fries which were also tasty, if a bit cold. Admittedly, some in the group were not as impressed with their food. However, the consensus seems to be that Elbow Room makes a good salmon, as everyone who had salmon as part of their dish had good things to say about it. After an intense week of restaurant meals, I was craving something homemade. I had a huge stack of new and interesting recipes I wanted to try, but I was pressed for time so I flipped through the pile quickly and went with the first thing that looked like it would require little prep time. 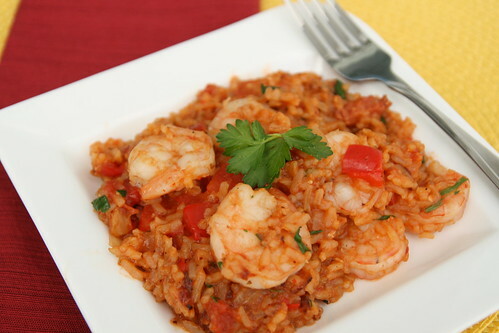 This Jambalaya with Shrimp and Andouille Sausage is pretty easy to make, very flavorful, and served my tummy well! This is the eighth (and last) in a series of posts on my family's first visit to Pittsburgh. To start from the beginning with Friday's lunch, click here. After what felt to me like an eating out marathon on Friday and Saturday, I thought it might be nice to stay home for a low-key brunch on Sunday. Now, what possessed me to think that I could single-handedly prepare brunch for six people after several days of accumulated sleep deprivation and a late night of St. Paddy's Day partying on Saturday, I don't know. And it turned out not to be a very smart idea after all! There were definitely a few disasters. My first ever waffle-making attempt ended up being an epic failure (though I did manage to turn the batter into pancakes - also a first attempt), and my experimental maple leaf-shaped eggs with sausages and veggies were, um, not so maple leaf-shaped (I turned that into an egg scramble instead). Between trying to cook too many things at once and attempting to clean up all the mess I had made, I didn't have any time to serve the delicious bread from Loafers with fresh-ground peanut butter from Giant Eagle Market District that I had especially purchased for my house guests. Luckily, my family was patient with me, and everyone was well-fed in the end. I think they even liked some of my failed experiments! Note to self: In the future, when preparing a meal for other people, go with what you know to be tried and true. My family left for Toronto Sunday afternoon. It was a great visit, and I hope I was able to achieve my objective of impressing them with all the great food that Pittsburgh has to offer, and I certainly hope they'll be back soon for more! If you've read the entire series, thank you! Feel free to check out the rest of my blog here. This is the seventh in a series of posts on my family's first visit to Pittsburgh. To start from the beginning with Friday's lunch, click here. Despite a very filling dinner at Silk Elephant, a few of us managed to find room for dessert. The promise of delicious frozen yogurt just across the street was too much to resist, I guess! I had first discovered Razzy Fresh last July before I even moved to Pittsburgh. R. and I were in town to take care of some housing issues and were meeting friends for dinner in Squirrel Hill. We had arrived early so we took a stroll around the block and happened upon Razzy Fresh. Now, to put this discovery in context a bit, I was living in Washington, DC at the time and a significant number of new self-serve froyo places (a trend that started in California, I understand) had recently started popping up everywhere in town, and I had become quite a fan. So I was very excited when I spotted Razzy Fresh, and despite the fact that we were about to have dinner soon, I just had to try some Pittsburgh froyo. The physical space that Razzy Fresh occupies is pretty small, and at the time they only had three machines serving six different flavors of froyo (since expanded to six machines with 12 flavors). Two things that I found super exciting about Razzy Fresh: taro flavored froyo and mochi topping. Taro is a root that is a bit like a potato but has a purple tint on the inside and a touch of sweetness that, to me, tastes similar to coconuts. I grew up on taro and taro flavored ice cream has always occupied a special place in my heart. In fact, after a failed search mission for taro ice cream in DC, I learned to make it myself (which will be the subject of a blog post to come, I'm sure). I bring this up so you can understand how excited and pleasantly surprised I was to find taro-flavored froyo, in Pittsburgh of all places! I guess I made the right decision to move here! I was also pleasantly surprised by the mochi topping. Mochi is a sweet Japanese rice cake, and ice cream wrapped inside mochi dough is a very popular dessert in the Japanese cuisine. Anyway, back to Razzy Fresh. Not only did Razzy Fresh impress me with their exotic offerings, but also the taste of their frozen yogurt, which strikes a good balance between sweetness and tartness. 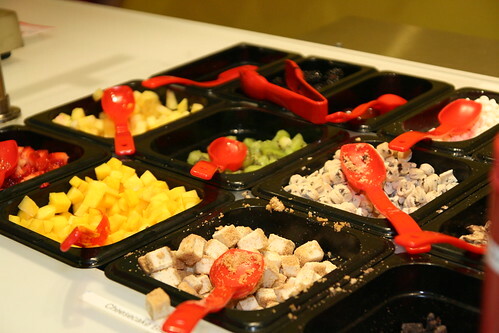 Their toppings are always fresh, as well. I typically like my froyo with strawberries, mangoes, and mochi. The fruits are always perfectly ripe, and I suspect they use champagne mangoes (which tends to be sweeter and tastier IMHO) as opposed to whatever variety you'd typically find at Giant Eagle. The mochi is also fresh as one can tell by how "chewy" it is - mochi that has been sitting out for a while tends to harden, and at Razzy Fresh, they clearly make the effort to ensure that the mochi never gets too stale. 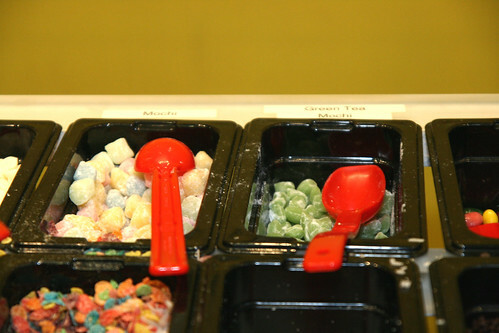 Close-up of the mochi toppings. In the past they've only had white mochi but now it appears they have a rainbow-colored variety and a green tea flavored mochi. Topped with strawberries, mangoes, and mochi. My brother and his girlfriend got the same thing I did, and my sister got strawberry banana to which she gave a thumbs up. I think that with the variety that Razzy Fresh offers, anyone can find something they like. The picture above was actually taken at one of Razzy Fresh's newer locations on Craig Street between 5th and Forbes, which is far more spacious than the Squirrel Hill location, so it is a better option for hanging out with friends, unless you have a problem with the college crowd as it is nested right in Pitt/CMU central. A third location on Forbes at Meyran in the former Kiva Han space had been in the works for several months and is rumored to have opened within the past few days. Expect a college crowd there too. 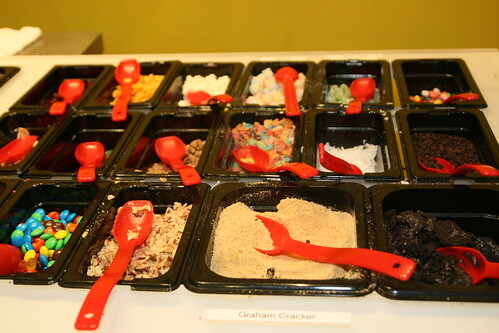 I have been to a few other froyo shops in town and they just haven't impressed me quite as much as Razzy Fresh did. Some I find to taste bad, even, but we won't name any names... Anyone who knows me knows I'm a self-proclaimed ice cream snob, thanks to Jeni's Splendid Ice Creams in Columbus, OH. I am beginning to fear that I am slowly becoming a froyo snob as well, thanks to Razzy Fresh! This is the sixth in a series of posts on my family's first visit to Pittsburgh. 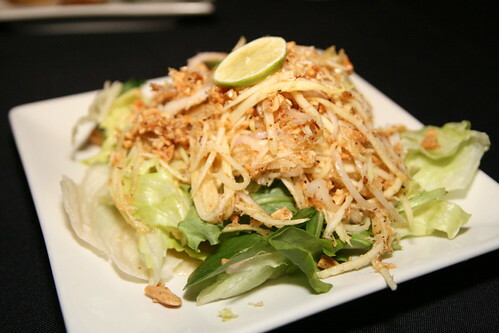 To start from the beginning with Friday's lunch, click here. My whole family loves Thai food, so I thought they might like that for Saturday's dinner. 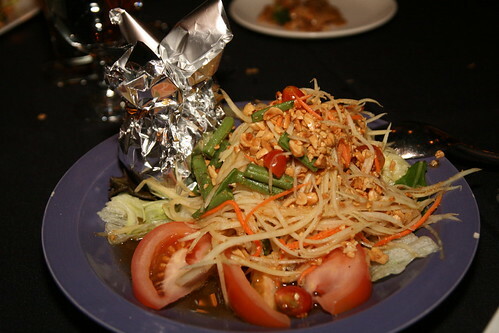 My parents can get a bit snobby when it comes to Thai food and my brother spent four whole months in Thailand last year, so there was a lot of pressure in selecting a Thai restaurant that would be of high quality to satisfy my family's lofty standards. 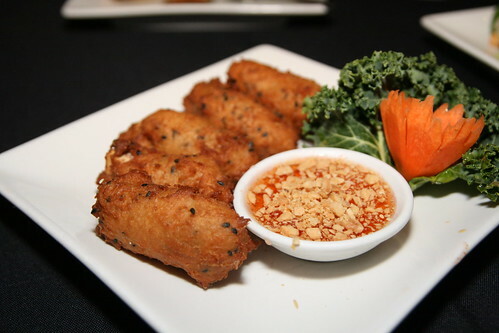 Luckily, I had been to Silk Elephant in Squirrel Hill before and knew the food to be excellent. 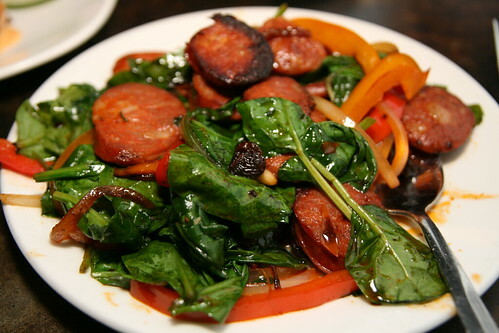 And even though tapas is not traditionally Thai, I thought it would add a unique element to one of our favorite cuisines. We each made some selections and dined family-style like real Asians do. My camera was snapping away as the dishes were brought out, so I will let the photos do the talking. 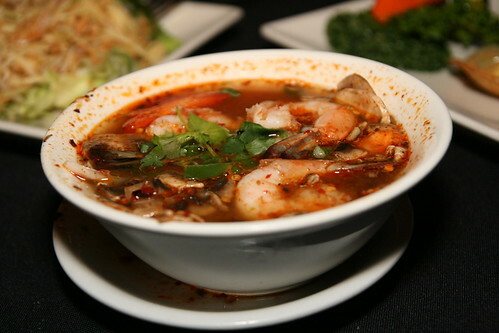 A very spicy hot and sour soup with shrimp, mushrooms, onions, and bell peppers. They don't skimp on the shredded mango in this one! 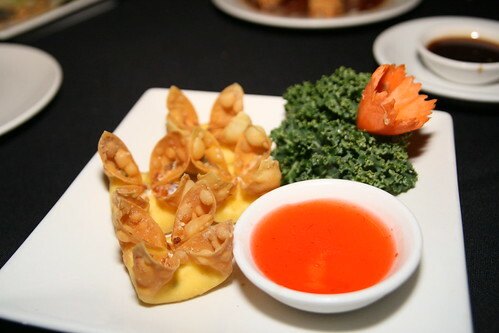 Crab with cream cheese inside a crispy wonton wrap. According to my brother, Siam Paragon is the name of a famous shopping mall in Bangkok. 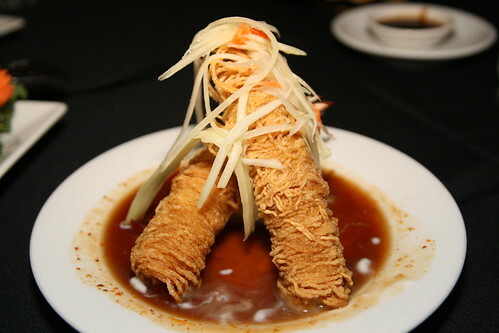 Not sure why this dish is called that, but it is delicious and is a signature item at Silk Elephant, with shrimp and crab wrapped in crunchy egg noodles and served with a curry sauce. 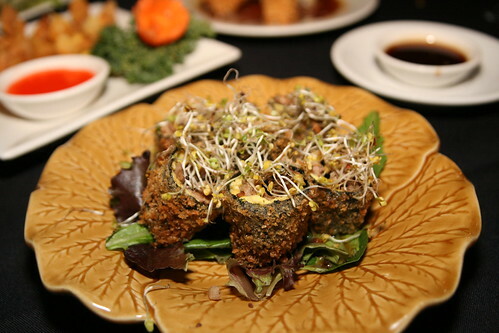 This was on the specials menu, with duck wrapped in a seaweed and deep fried, topped with bean sprouts. 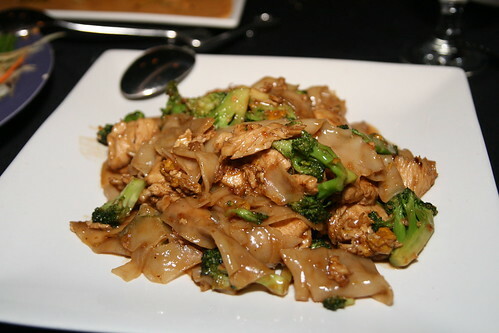 Thick noodles with broccoli and a brown sauce, and we ordered it with chicken. My brother was very impressed with this one, noting that it tastes just like how they make it in Thailand. 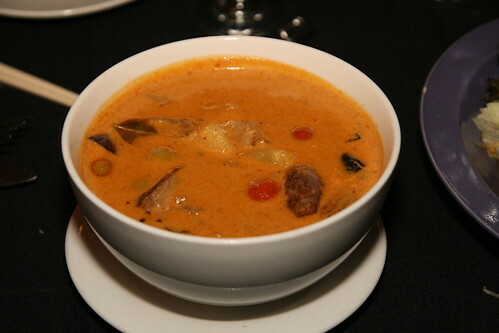 A very good duck curry dish with grapes, pineapples, and tomatoes, reminiscent of the duck curry I had in Thailand last year. Oh Thailand, how I miss you! This one is off the specials menu, and pretty self-explanatory. Unfortunately, the sea bass is hidden underneath the salad so you can't really see it, but really, it's there and it's good. 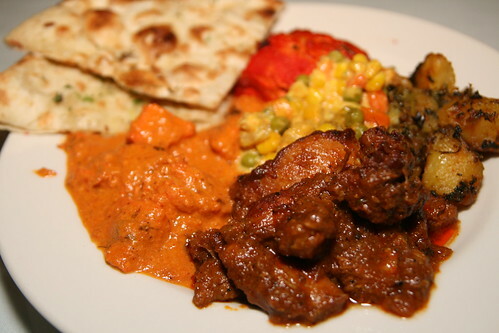 Another great curry dish also off the specials menu. We ordered it with chicken. Next up: Saturday night's post-dinner dessert at Razzy Fresh. This is the fifth in a series of posts on my family's first visit to Pittsburgh. To start from the beginning with Friday's lunch, click here. 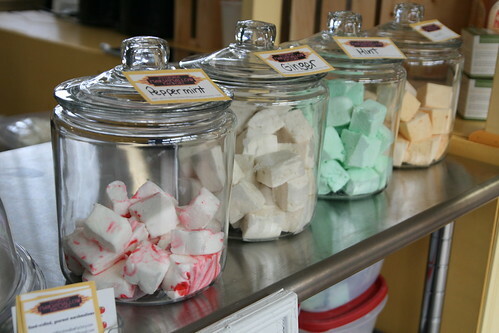 After getting my beloved sesame cookies from Sustenance Bakery at the Pittsburgh Public Market, I wandered around for a bit and checked out the Pittsburgh Marshmallow Factory. 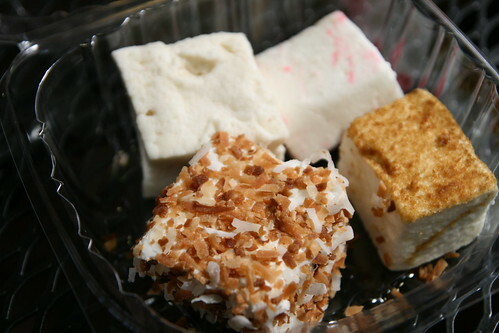 I had strolled by their stand on previous trips to the Market, but seeing that I'm not a big marshmallow person, I never really bothered to stop by to see what they had to offer. 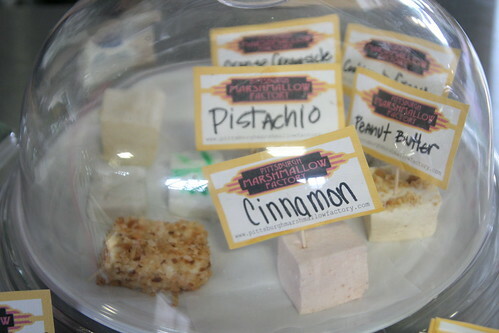 On this day, I was drawn by the interesting flavors of marshmallows they had, all homemade! 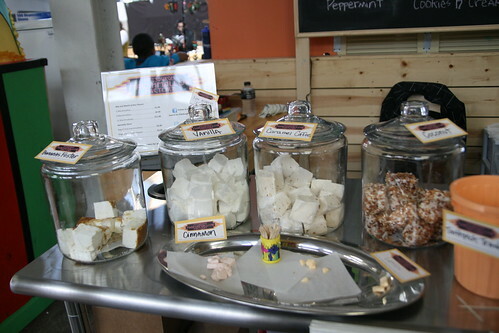 Clockwise from bottom: Coconut, ginger, peppermint, and banana foster marshmallows. ...which I completely devoured in a single sitting. Once again, the Pittsburgh Public Market won the battle against my self-control. As an aside, My sister got peppermint, lemon, pina colada, and cookies and cream. She seemed to have particularly liked the lemon one. 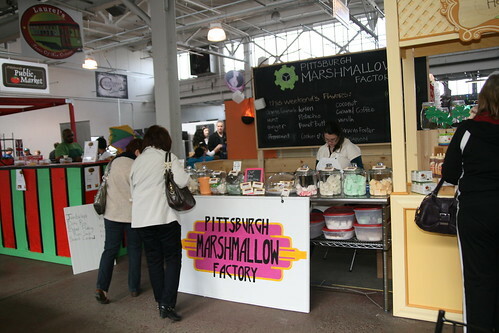 Update: As of December 18, 2011, the Pittsburgh Marshmallow Factory no longer sells marshmallows at the Pittsburgh Public Market, but they remain available online. This is the fourth in a series of posts on my family's first visit to Pittsburgh. To start from the beginning with Friday's lunch, click here. After brunch at Pamela's, we took a quick stroll along Penn Ave, then headed to the Pittsburgh Public Market on Smallman St. Now here's a hidden gem even many Pittsburghers have yet to discover! Opened just a few months ago, the Pittsburgh Public Market features fresh produce, meats, baked goods, coffee, and more - from local sources. In other words, it is a locavore's paradise. 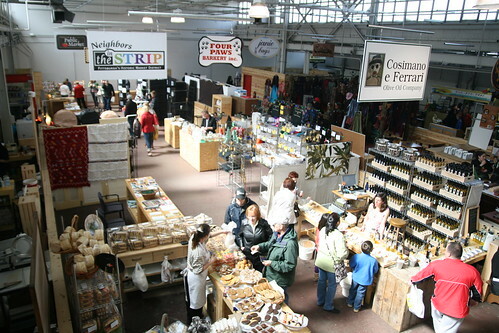 On Fridays, Saturdays, and Sundays, you will find lots of amazing local foods and other goods at the Pittsburgh Public Market. I really hope they continue to grow and expand. The Binge! Eating in Pittsburgh blog recently wrote up a nice piece on the Pittsburgh Public Market. Here, I will focus on the two merchants I visited on this trip. Just as soon as you walk into the Pittsburgh Public Market, you'll come across a little bakery stand on the right. That's Sustenance Bakery. 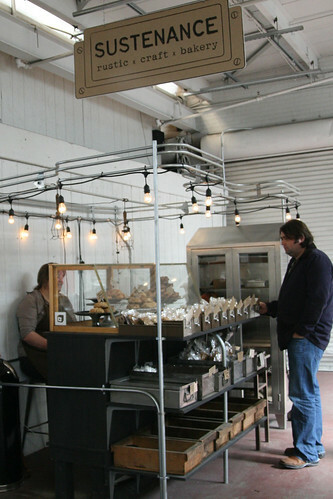 Sustenance Bakery is an all-natural bakery that uses many locally-sourced ingredients in their baked goods. In the past I've had a couple different kinds of muffins and cookies with creative flavors. One was a citrusy-grapefruit muffin (forget what it was called) that was very moist; another was a cookie topped with fresh ground peppercorn that was surprisingly good. But the one thing that keeps me coming back to Sustenance again and again is their sesame cookies! Just the slightest bit chewy and chock full of the flavor of sesame seeds. Update: As of December 18, 2011, Sustenance Bakery no longer sells baked goods at the Pittsburgh Public Market. 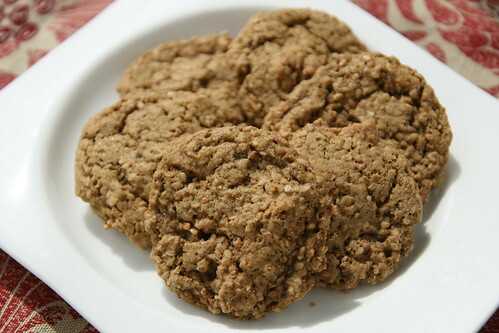 Owner Sarah Kelby Lewis' recipe for the Toasted Sesame Cookies was published in the Food & Wine Magazine and can be found here. Read about my attempt at baking them here. This is the third in a series of posts on my family's first visit to Pittsburgh. 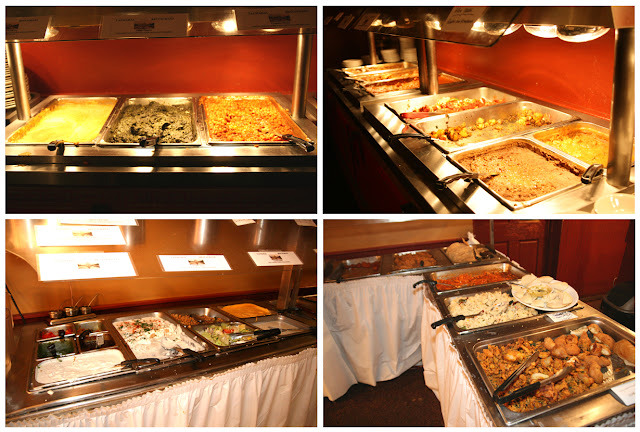 To start from the beginning with Friday's lunch, click here. On Saturday morning, I thought I'd take everyone down to the Strip District for a quick visit. There are many excellent food establishments in the Strip that I knew we wouldn't have time for, and seeing that we would be down in that neighborhood in the morning, I thought it would be appropriate to start the day at another iconic Pittsburgh restaurant, Pamela's P&G Diner. My first ever visit to Pamela's was during my first month in Pittsburgh when I was staying in temporary housing in Shadyside. I was hungry one day and stumbled across Pamela's Shadyside location having never heard of them before (ha!). I ordered their strawberry hotcakes and was instantly hooked. Instantly. Now, I don't typically go out for breakfast a lot (especially at diner-type places) due to my body's unfriendliness towards egg yolks and milk, leaving me with few options and none of which I'm particularly crazy about. And that includes pancakes. Don't get me wrong, it's not that I don't like pancakes, but they don't top my favorites either. At Pamela's, however, they make it differently, something like a cross between a pancake and a crepe (which I love). And the result is out of this world. 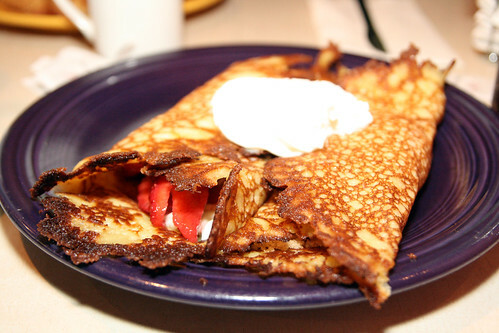 Of course, by now I am well aware that Pamela's is actually quite famous for these crispy thin hotcakes, so much so that President Obama actually invited Pamela Cohen and Gail Klingonsmith, owners of Pamela's P&G Diner, to serve his first memorial day breakfast at the White House. On this Saturday morning, we didn't quite make it to Pamela's until about 10 am. Which meant that by the time we were seated, it was already close to 11 am, so this meal ended up being brunch instead of breakfast. Most of us ordered the strawberry hotcakes, myself included. 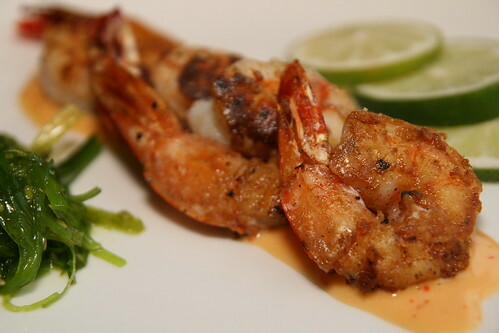 Just looking at this makes me hungry! I also tried some of my sister's lyonnaise potatoes, another famous Pamela's item. They were very well-seasoned and everybody gave it high praise. My whole family came to visit from Toronto this past weekend. It was their first time in Pittsburgh and I had just two days to show off my new hometown. Being a bit obsessed with food, I naturally paid special attention to selecting the dining establishments where I would take them, especially because they would be comparing Pittsburgh against an awesome foodie town. My goal was to strike a balance between 1) the must-visit touristy places that have come to define Pittsburgh over the years; 2) the slightly lesser known, independently-owned, and relatively newer restaurants with awesome food; 3) the casual; 4) the elegant; and 5) the sustainable. My next few blog posts will chronicle our Pittsburgh food adventures during my family's visit. The first stop, of course, had to be Primanti Brothers. Local Pittsburghers already know about one of the most famous establishments in town, but for those of you not from around here, the first Primanti Brothers restaurant was started in the 1930s in the Strip District. At the time, the Strip District was a hub for many wholesale produce businesses and warehouses, and legend (read: Wikipedia) has it that Joe Primanti wanted to serve meals for truck drivers making overnight deliveries to the Strip that would allow them to eat with one hand and drive with the other. Somehow or another, he decided it would be a good idea to dump the side of French fries and coleslaw right into the sandwich along with whatever meat is in the sandwich. And the famous sandwich was born. (See here for the supposedly real - but IMHO less interesting - story.) 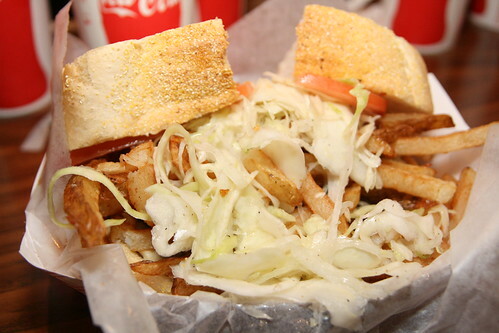 In any case, Primanti's sandwiches became a hot item and the practice of dumping fries in food has become something of a "Pittsburgh thing," for better or worse. If you ever travel to Pittsburgh and see a "Pittsburgh salad" on a restaurant menu, expect fries on top of your greens. 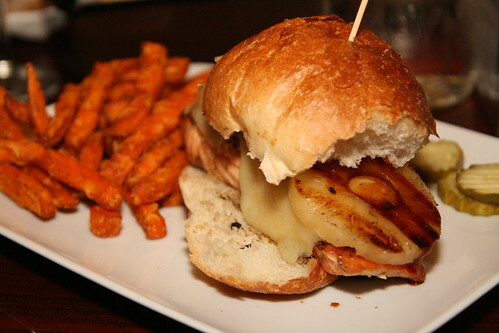 And of course, all you can see in the sandwich are the fries and the coleslaw. I decided to try and take another picture of the sandwich from the cut side. If you try really hard, you can see the beef nested underneath the mountain of fries. 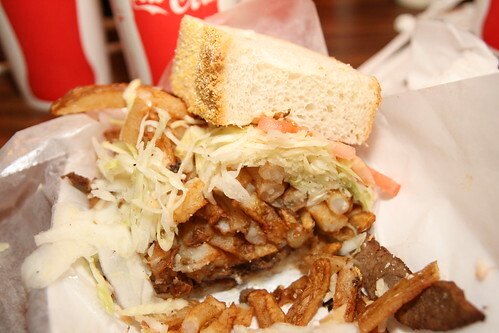 If you are even remotely health-conscious, Primanti's is one of those places you don't want to visit more than once a year, but it is something you might just crave once in a while. I am not big on either fries or coleslaw, but there is something about that combo inside a sandwich that actually makes it quite tasty. Don't ask me why, but even I (who is typically more of a fine-dine kinda gal) like a Primanti's sandwich once in a while. The best part of this visit was seeing my parents struggle to open their mouths wide enough to fit such a large sandwich! 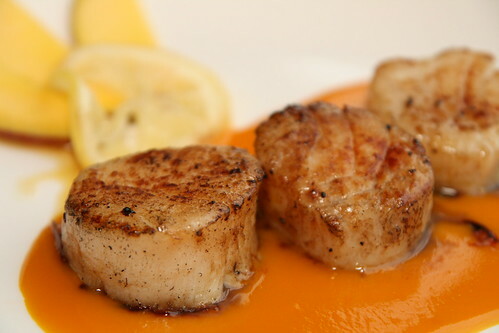 Next up: Friday's dinner at Restaurant Echo in Cranberry Township. This was one of the specials and tastes as good as it sounds. 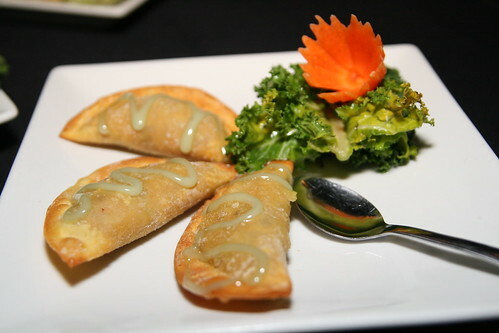 One of the more filling tapas, and one of our favorites. 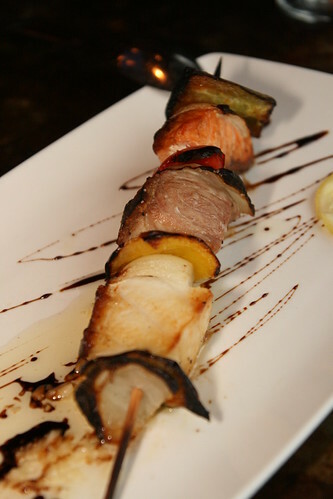 The shish kabob comes with three large chunks of fish. The white fish, in particular, was fantastic. Very fluffy and melt-in-your-mouth good. This was probably my personal favorite. The mango sauce is to die for. I think this ended up being just the right amount of food for the two of us as we are pretty small eaters (which is always a bit of a tough thing for me because I love food so much and I can never eat a lot of it in one sitting). I should add, too, that the Kobe beef carpaccio was recommended to me as well, but we didn't get that this time around. 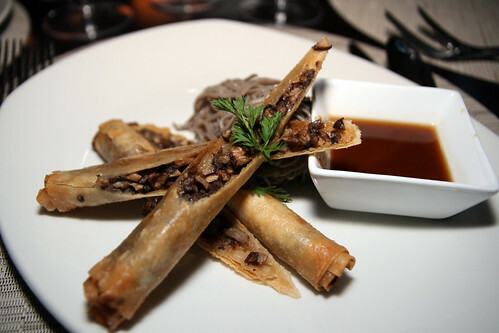 It is definitely on my wish list of dishes to go back and try! Between meals out I managed to cook up a couple of things this week. 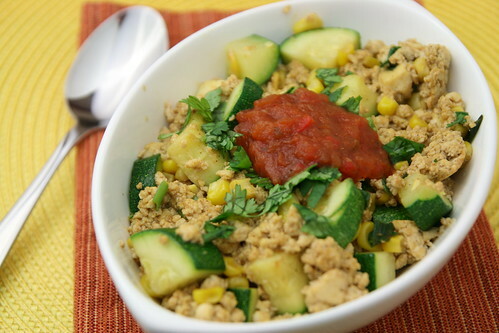 One was a Southwestern Tofu Scramble. I must admit I wasn't really sure about it at first, especially with the inclusion of cumin which I tend to think of as an Indian spice, but the end result was super tasty. It actually tastes a bit like scrambled eggs, minus the cholesterol. 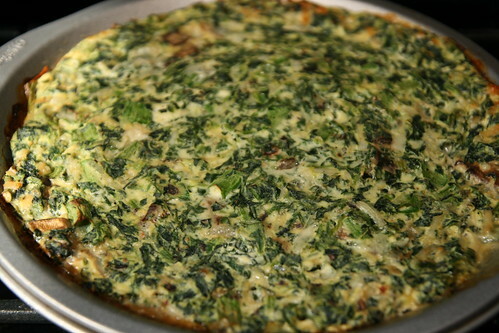 This is a versatile dish that, as the recipe states, can be enjoyed for breakfast, lunch, or dinner. Finally checked out the Taj Mahal on Sunday night. Taj Mahal is currently expanding their space and the outside of the building is completely covered in house wrap, so if you didn't notice the spray painted "OPEN" sign, you might not realize they are still serving food inside. But clearly they are not hurting for business because the place was packed! A few pictures of the buffet offerings. I had to snap these quickly because people were trying to get food. I enjoyed some chicken curry, chicken tikka masala, tandoori chicken, vegetable korma, and aloo methi (potatoes with fenugreek leaves), with a side of naan. 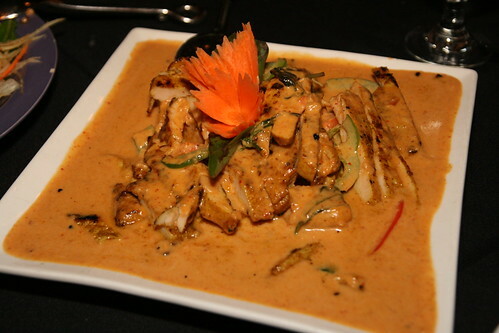 The chicken was perhaps slightly tougher than I'd prefer but the sauces and spices were simply wonderful. 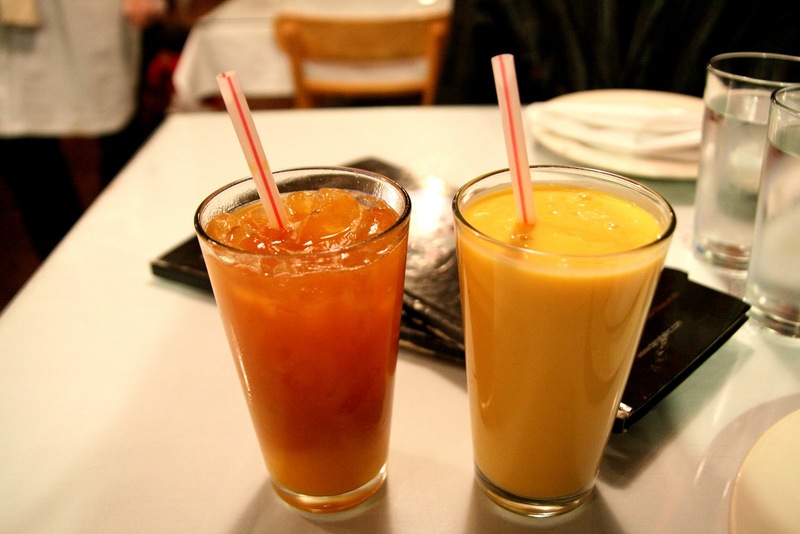 For beverages, we got some delicious mango iced tea (left) and mango lassi (right). And...introducing the BEST part of the meal: Kashmiri Kulcha. 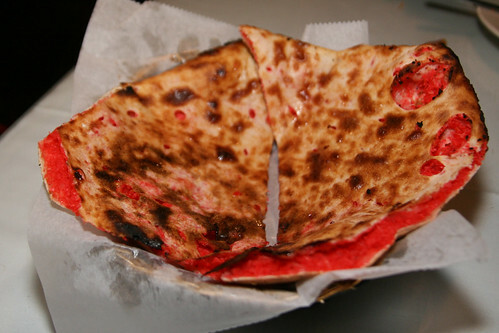 Naan stuffed with nuts, raisins, and cherries. 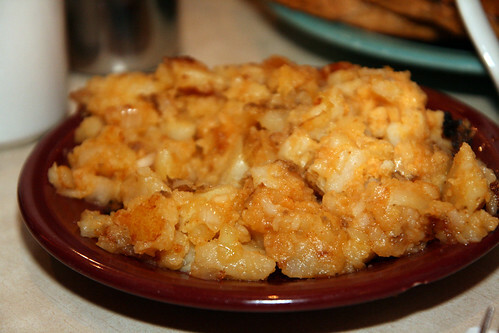 It has a good bit of sweetness to it and the stuffing tastes to me like coconut.